The Office of National Statistics have recently released (31st October 2014) their “pink book”. This shows the economic transactions between UK residents and the rest of the world. It also draws a series of balances between inward and outward transactions, provides a net flow of transactions between UK residents and the rest of the world and reports how that flow is funded. 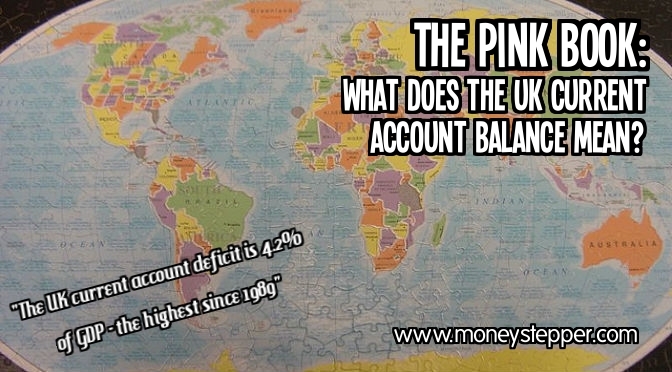 What does the 2013 Current Account Balance show? Well, the balance of payments hit the news in 2013 after the 2012 accounts showed that the deficit in the current account balance was £59.2bn. This was the highest ever amount in nominal terms, and was equal to 3.8% of GDP (which was the highest that it had been since 1989). How are we getting on one year later? Not great. The deficit on the current account balance widened further in 2013, to a staggering £72.4bn. This now represents a whopping 4.2% of GDP. The increase was largely due to an increase in the trade in goods deficit which was fueled by a £3.6bn increase in the import/export of finished manufactured goods. Given the UK has long been proud of its heritage in manufacturing, this will be a worry for many in the industry. What can the UK current account deficit tell us about the housing market? Looking through the historical data, I’ve found two things that concern me a little. The first is the potential correlation between the current account deficit as a percentage of GDP and house price changes in the years that followed. Just looking at the scatter graph doesn’t give us a brilliant correlation. But, once we add a trend line, we can see the general pattern. Moreover, you will notice in the data that the UK has seen negative house price growth over a 2 year period only seven times since 1973 (the starting point for our house price data set). All seven of these falls were noted when the current account showed a deficit of greater than 1% of GDP. Equally, out of the four years where the annual deficit was greater than 3% of GDP, 3 out of 4 showed negative house price growth in the following years (with an average of fall of 1.9% per year). I’m not an economist and hence I am not going to draw any conclusions from this data. We can appreciate that the data set is fairly small and understand that correlation does not imply causation. However, a current account deficit often indicates economic weakness and equally house prices generally do not perform well under these conditions. 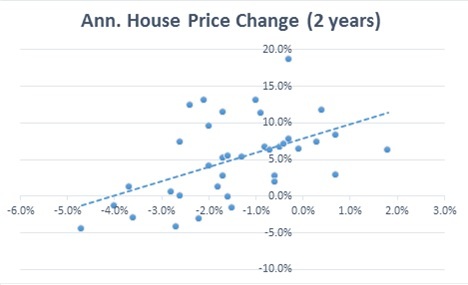 Given our conclusions reached on the UK housing market from other previous articles from earlier in the year, this may add more fuel to the fire regarding the house market reaching its top (especially in London). What can the UK current account deficit tell us about the stock market? 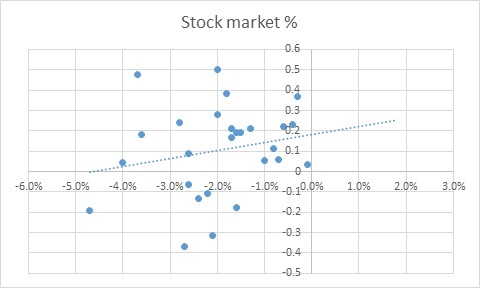 What about the correlation with the UK stock market? Can we see anything similar there? This time we look at the stock market performance in the year following the annual deficit reported figure. For example, the 2009 deficit would be compared to the performance of the FTSE 100 from 01st Jan 2010 until 31st Dec 2010. A shorter term view has been taken here as the stock market generally is considered to look forward over a shorter term than housing markets. Another worrying sign – Europe! We have previously written about the economic situation in Europe and how this does not seem to be improving. Again, the 2013 current account balance brings up some worrying data around Europe. 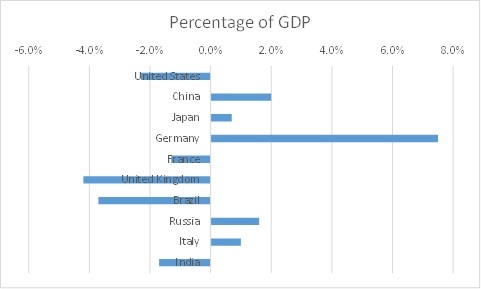 The following chart shows the current account balance with certain other regions in the world. Whilst we have a surplus with the Americas, and we seem to be making up ground with Asia, the account deficit with Europe continues to plummet (now exceeding £100bn). On the same day that this report was released, the latest EU unemployment figures for September 2014 were also made available on the Eurostat website. This shows that youth unemployment stood at 23.3% in the Euro area (showing a truly staggering 53.7% in Spain). The 2013 current account balance shows that we are failing further into deficit. Research indicates that this isn’t the best thing for a country’s economy. Historical examples of economies drastically failing are usually twinned with a current account deficit of at least 5%. We are still not touching those levels, but the combination of this deficit (when we can see that the major cause is reduction in export of manufacturing) and rapid increases in the stock and housing markets in the past few years may lead to some concerns over possible crashes. With a combination of the UK’s deficit being the highest out of all the top economies, and historical data showing signs that deficit may correlate to weak housing market and stock market performance, this may cause us a little worry! Of course, this data alone does not indicate that we should all be running for the hills and shoving our cash in the mattress under the bed, but it will be interesting to see how the markets react to this news over the coming months. As a long term investor, what should you do as a result of this news? The same thing as always: ensure you have a diversified portfolio, across different asset classes, different markets and different geographical regions. If this current account balance does mean bad things to come in the UK, then this will only be a small part of your wider portfolio and you should be fine! Why Should I Switch My Current Account? Is It Time To Change Your Bank Account?